Last weekend we seized the beautiful weather and walked to the US Botanical Gardens to see their train display. I was hoping Behr would be interested. Well, not only was he interested, Behr might have officially fallen in love with trains on Sunday morning! Plus Thomas and Percy made an appearance - note: the fact that I know these things means I have entered a whole new stage in raising a boy! Behr has been carrying around the trains that were in his Easter eggs. The staff at the Botanical gardens does an incredible job each year creating a whimsical village with multiple train tracks. Their artistry makes the display a treat for the parents too. You might also like to see our last visit when there was an International Orchid display. I think I need to take another trip to DC. If not for this, then just because you've made me remember that I LOVE IT THERE. That second to last pic of Behr is so stinkin' cute. He's seriously precious! 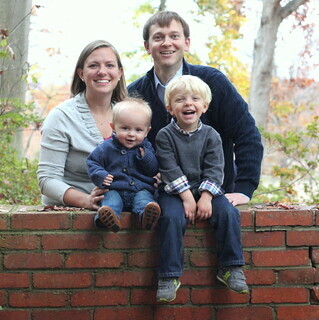 Behr's "cheese" smile in that family pic is just to much cuteness!!!! Those trains look like SO much fun! My boys would be in heaven there!! !